As a staff, we are working really hard on helping the children to improve their readings skills. We have looked carefully at which skills the children need most help to develop and have looked at how to best teach and rehearse these skills. There are two outcomes which will hopefully be of interest to parents: one is that we are going to use the acronym D.E.R.I.C. with the children and in our planning. This is so that, as we plan, we are sure that we have covered the range of skills. It also gives us consistent vocabulary to use with the children so that they can articulate which skill they are using. 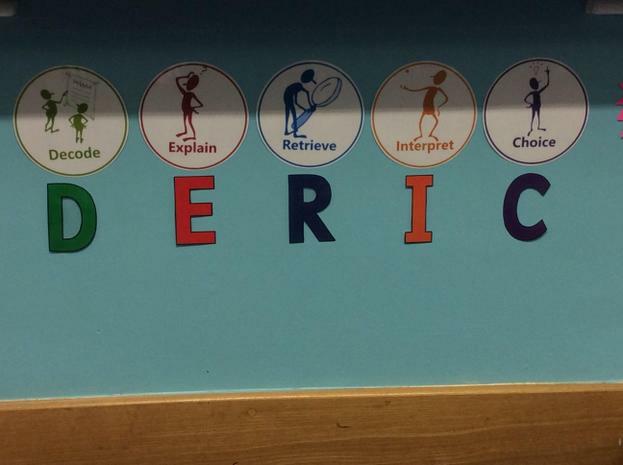 The teachers are putting up DERIC displays in all classes apart from Eagles (as they already know the terminology) and Wrens (they just need the 'D'). DERIC stands for Decode, Explain, Retrieve. Interpret and Choice. The other development is that we have produced bookmarks which link to the book band colours and give questions to ask before, during and after reading with the children. We are currently trialling these and looking at how to get them made so that they are durable and will be giving them out in the near future.